There are three levels of Music Festival competition - local, provincial and national. Each year the local music festivals recommend participants to go forward to the provincial competition. Each participant must have met specific criteria for their category of performance in the local festival and be recommended by the festival adjudicator. 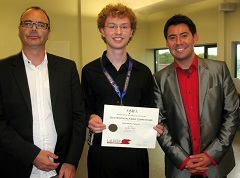 This year's provincial competition was held at Wilfrid Laurier University in Waterloo, Ontario from June 12 - 17, 2011. It is an intense competition with a large number of participants representing 33 different music festivals from across the province. 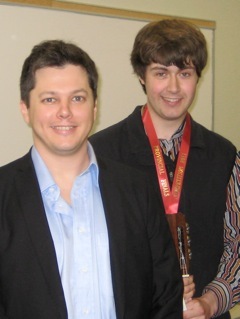 Our participants did extremely well with James Lowrie taking first place in the Guitar Open Level (seen here to the right), Luke Bell taking second place in the Piano Open Level (seen here to the left) and Haris Imsirovic receiving Honourable Mention in Guitar Grade 7 (regretfully, no photo available). Congratulations on a job very well done - you do us proud!